Dr. Seuss Week at Shiloh! It's Dr. Seuss Week at Shiloh! Each day will have a special theme and staff members are enjoying sharing their love of Dr. Seuss with students! 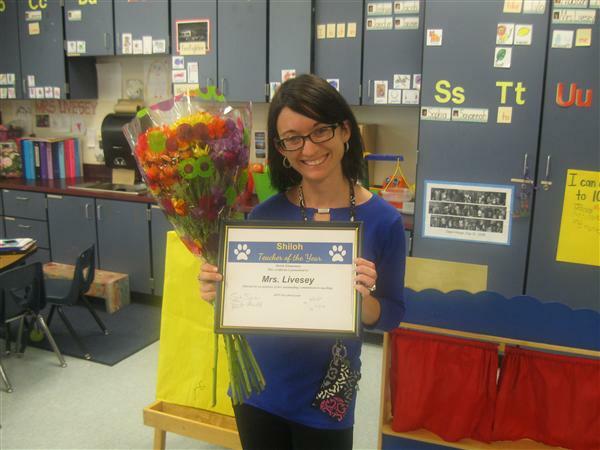 Congratulations to 2nd grade teacher Mrs. Foster for being named a Top 10 Finalist for the UCPS Teacher of the Year! Union County Public Schools has announced its elementary schools of choice for the 2019-2020 school year. Families may apply for admission through lottery to any elementary school within the district whose student population is less than 90% of the capacity as determined by the district. Shiloh community members: Please note that we are now on our winter break. After today, December 14, Shiloh's students will not return to school until Monday, January 7. We hope you are able to enjoy time with your family and friends over the coming break. Students, also be sure to make time for reading! 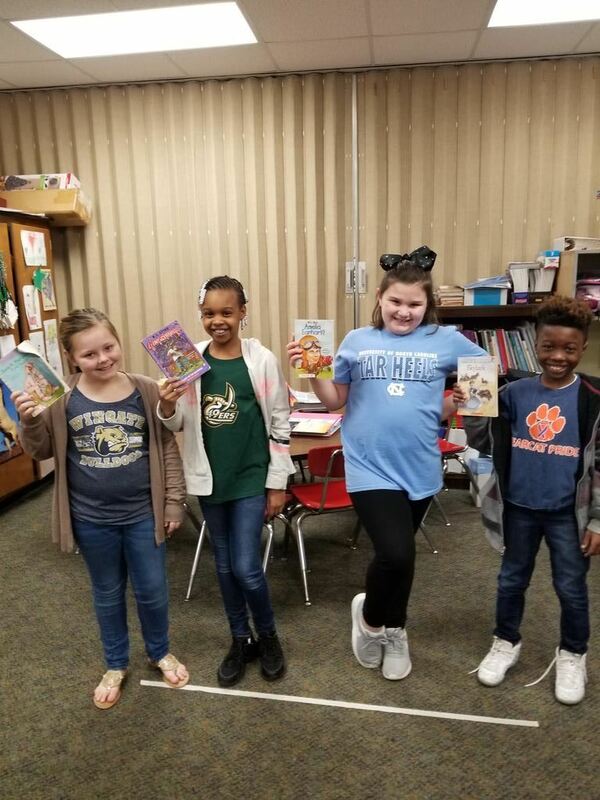 As a part of its Read A Palooza community event, Shiloh Elementary hosted a book drive to benefit schools affected by Hurricane Florence. Thanks to an outpouring of support from parents and students, faculty and community members, the school's book drive ultimately collected 3,000 books. National Family Volunteer Day is held annually on the Saturday before Thanksgiving. This year Shiloh was chosen as one of 100 grant recipients from all the applications that were submitted nationwide. 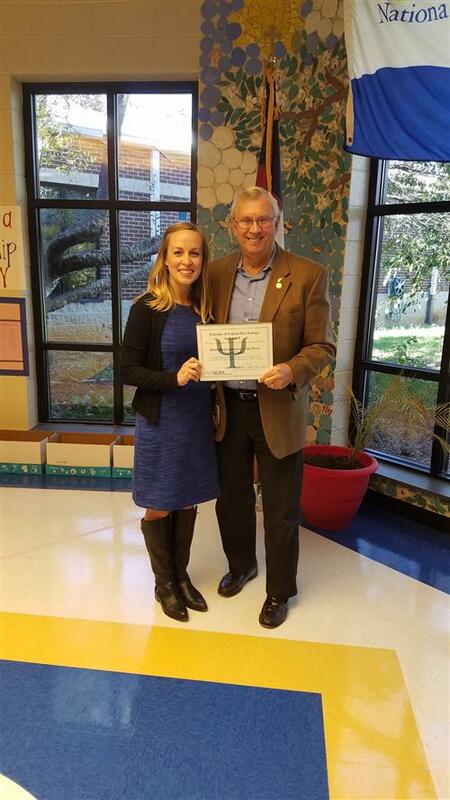 NC House Representative for Union County District 68, Craig Horn, visited Sara Ryan, UCPS School Psychologist, at Shiloh Elementary on October 22 to receive his Friends of School Psychology Award from the NC School Psychology Association. Representative Horn and Mrs. Ryan first met over coffee at Alice Jules last spring to talk about the roles of school psychologists in supporting school safety and mental health in NC public schools. Don’t forget to make time for reading! Shiloh’s Fall Book Fair has arrived! Please come by the Media Center for our Fall Book Fair! It will run from September 19-27! 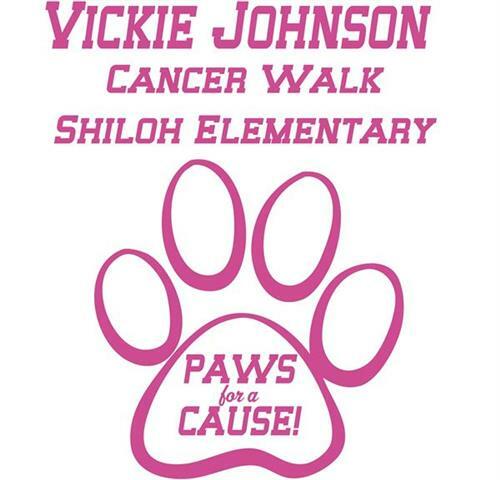 Our school is proud to announce that we are going to participate in the Vickie Johnson Cancer Walk on October 27, 2018 from 8 am - 11 pm on the Shiloh Elementary School track. The event is named in honor of long-time Shiloh After School Director Mrs. Vickie Johnson who organized and created these walks in past years at Shiloh. We are proud to say that Mrs. Johnson will be at this year’s event. Shiloh gives back to the community! On Saturday, August 23, Shiloh staff and family members came together to help the community. Shiloh participates in the annual United Way Day of Caring event. This event was designed to help those in our community who are in need of assistance. Our team helped work around a home in the community to enhance its appearance. Shiloh ‘teams’ up with Sun Valley High School! Shiloh’s students and parents were treated to a visit by students from Sun Valley High school on Friday morning, August 17. 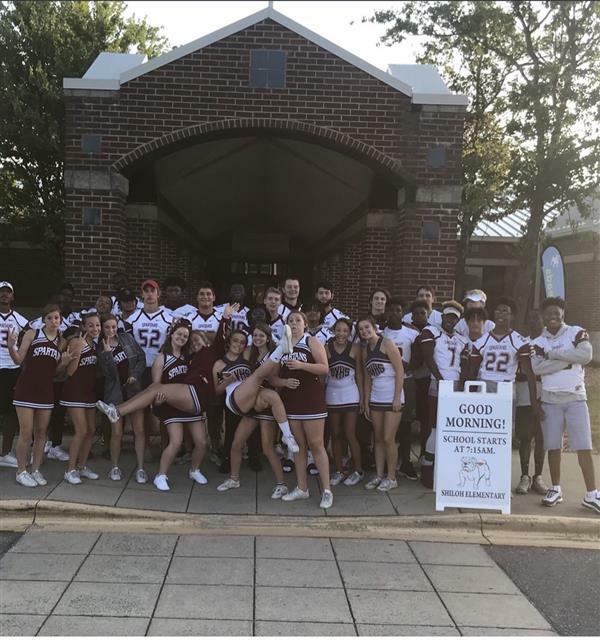 Members of both the Sun Valley High School cheerleading team and the football team were on hand in their uniforms to greet and assist Shiloh students as they exited their cars in the morning car rider line. Shiloh’s Read-A-Thon is in full swing! We are working hard to support literacy at Shiloh, and we thank you for your support of this literacy-based fundraiser! For the fundraiser, our students will read each day for ten days for up to thirty minutes, depending on the grade level. This will last through August 28. 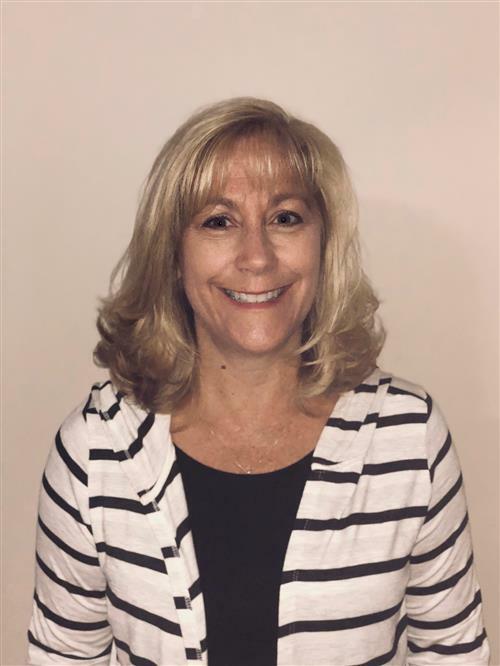 Please welcome Deborah Sharp to Shiloh! Hello! My name is Deborah Sharp and I am excited about joining Shiloh this year. I am originally from the mountains of Western North Carolina where I started my career in education over 20 years ago. Shiloh welcomes our new families! 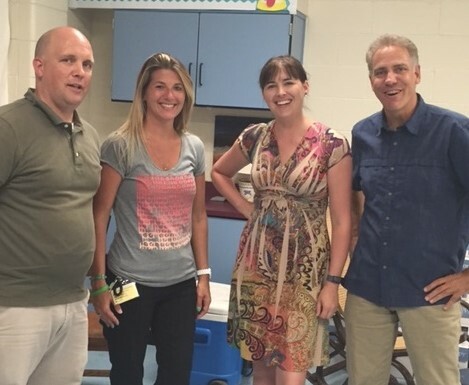 On Tuesday, August 7, Mr. Spencer, Mrs. Aldredge, and Mrs. McGinniss welcomed a group of new parents to Shiloh. Parents who are new to the school were invited to come in and learn more information about our great school. Please welcome Taylor McClellan to Shiloh! Hello! My name is Taylor McClellan and I just recently graduated from UNC Charlotte. This will be my first year teaching and I am super excited to be at Shiloh! I am from Charlotte, NC and happy that I am able to teach close to home. Please welcome Anna Allen to our staff! Hello! My name is Anna Allen. I was born and raised here in Union County. After I got my teaching degree at Appalachian State University, I couldn't wait to come start my career here in the same county where I had many amazing teachers as a child. Shiloh’s 1st grade team is leading the way! Shiloh’s 1st grade teachers are working hard each day with their students. 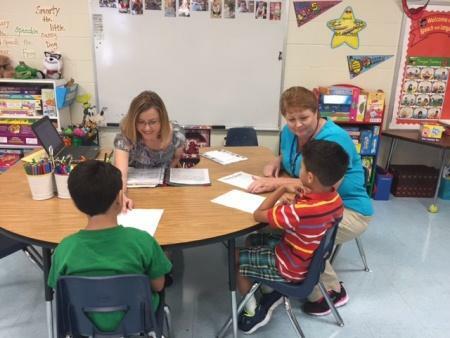 Mrs. McCraney, Mrs. Lee, Mrs. Dunn, and Mrs. Garcia (as pictured) can be found at any time of day working with small groups of students, reading with their students, and enjoying their time with their students. This veteran group of teachers jumped right into 2018-19 on the first day of school, and they are off to a great start. Shiloh’s First Day of school was a success! On Monday, July 23, Shiloh’s 102nd school year began with great success. Mr. Spencer, Mrs. Aldredge, and the entire Shiloh staff welcomed the students for the start of what is shaping up to be a great year. Shiloh’s staff jumps into 2018-19! Shiloh’s staff officially returned on July 16 for the 2018-19 school year. Their first day back consisted of a staff meeting that was full of skits, group activities, team building skills, collaboration, and refining the mission and vision for the upcoming school year. Mr. Spencer and Mrs. Aldredge are excited to return for another year at a school with such an amazing staff and overall terrific school community. “Rocking in Their Summer Shoes"
Shiloh’s Kindergarten teachers have spent the past few weeks “Rocking in Their Summer Shoes." 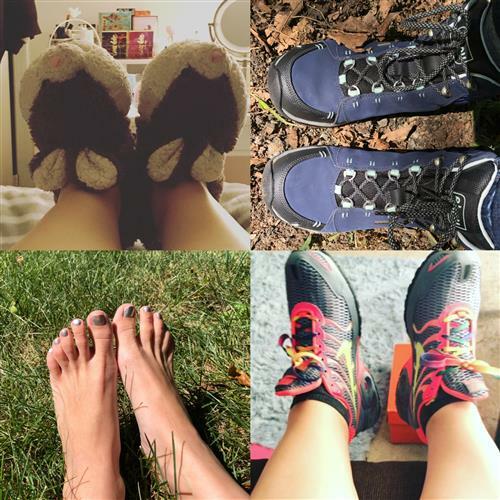 Hiking, exercising, traveling, relaxing, reading, organizing, and spending time with family and friends has filled their summer days and nights. Hello from Pre-K! Enjoy the Rest of Your Summer! A few tips for the next few weeks: · Purchase a backpack together with your child. If possible, let your child choose it himself. This gives him a sense of control and emphasizes the fact that he is a “big kid” starting Pre-K.
Shiloh proudly offers the Spanish Dual Language Immersion program! At Shiloh, we are entering our 7th year of offering the Spanish Dual Language Immersion Program to students in all grades. Specifically, Shiloh has one class in each grade level (Kindergarten through 5th grade) that is a Dual Language classroom. We have amazing teachers in our program, and last year’s Spanish immersion team is pictured with this article. Shiloh prepares for another great school year! At Shiloh Elementary School, we will begin our 102nd school year on Monday, July 23. We are very excited to continue the tradition of excellence at our great school. Whether you are new to our school community or you are a returning family, we certainly welcome you to the upcoming school year! 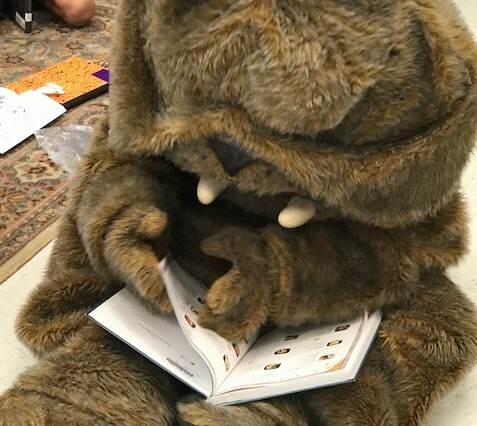 Shiloh Bulldogs: Be sure to keep up that summer reading! We hope our students are enjoying their time with family and friends this summer. We also want to make sure that you find time each day for reading! We’d love to hear about all the great books and stories that you have read this summer. Now that school is out for the summer, don’t forget to read over the summer! Be sure to set aside time each day for enjoyable reading. It’s important to keep your reading skills sharp while school is not in session. Shiloh and Sun Valley celebrate our 5th grade Spanish immersion students! On May 23, Shiloh and Sun Valley Elementary held a special ceremony to recognize the current 5th grade students in the Spanish Dual Language Immersion program. 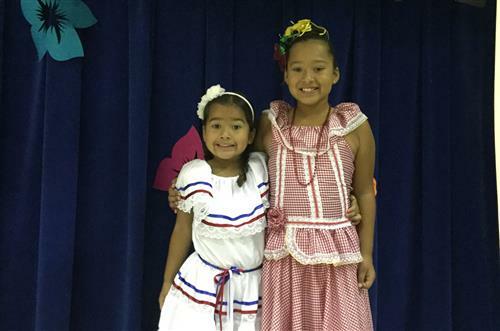 These are the first students in UCPS to go through the Spanish immersion program! 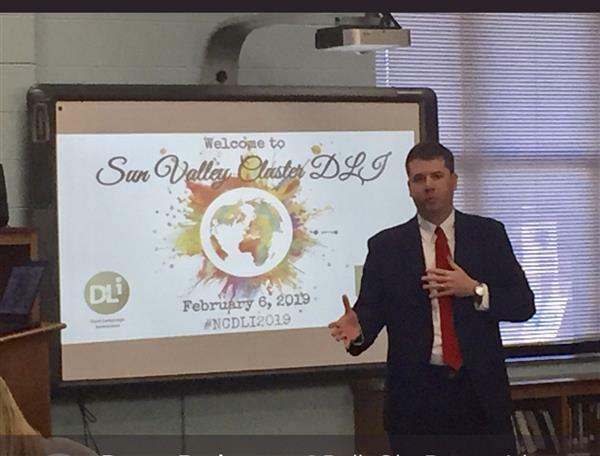 Teachers, parents, and administrators from both schools, along with UCPS Central Services staff attended the event held at Sun Valley Elementary. 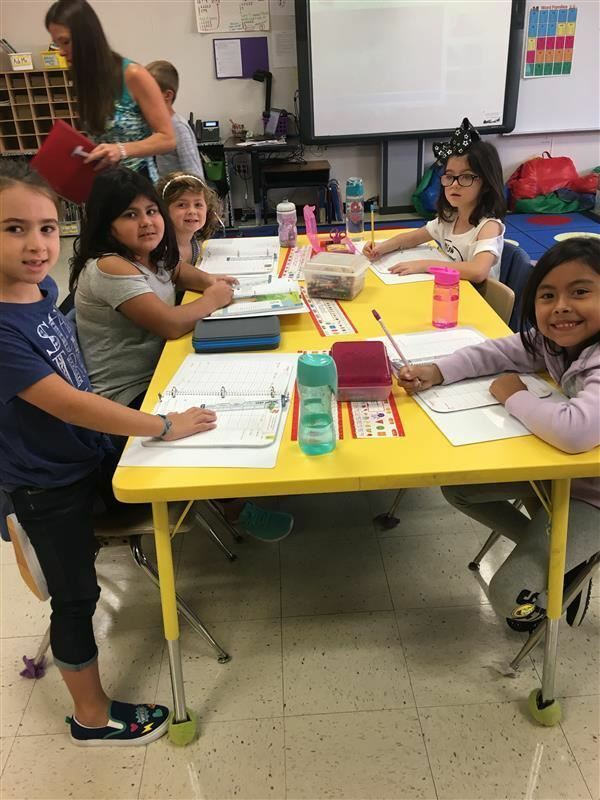 In the fall of 2012, a group of kindergartners made history as they walked into the Spanish immersion classes at Shiloh and Sun Valley elementary schools. 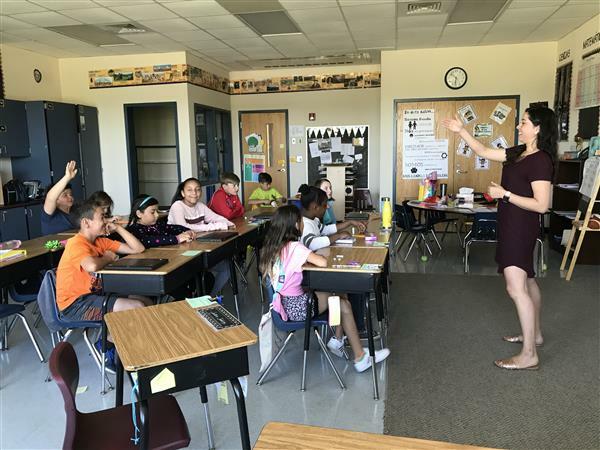 Those kindergartners are now fifth graders who are preparing to make history again as the first students to participate in the district’s Spanish immersion program at Sun Valley Middle. 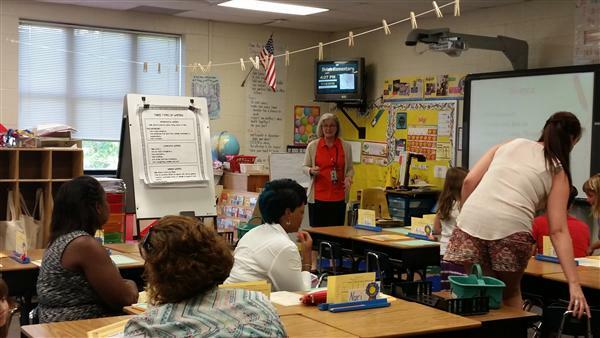 The Shiloh Elementary staff meeting was held in the AIG classroom this week. 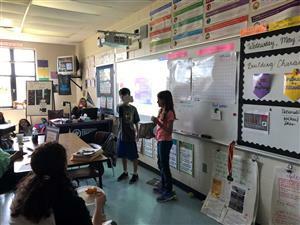 The students presented information about the differentiated curriculum of AIG to the staff. Shiloh is proud of our Girls on the Run team! 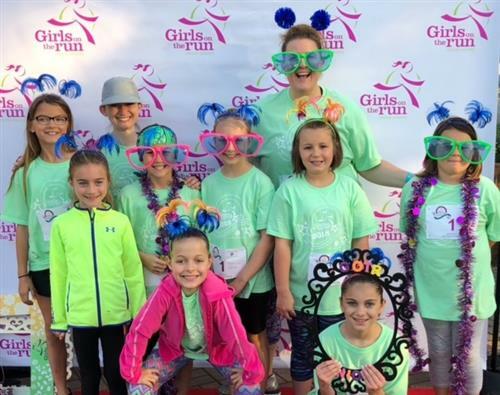 Shiloh's Girls on the Run team participated in their annual Spring 5K on April 28 in Lake Park. Coaches Mrs. Kincaid, Mrs. Livesey, and Mrs. Long have worked with our wonderful girls throughout the school year. The girls had a great time at the race, and they have so much to be proud of! 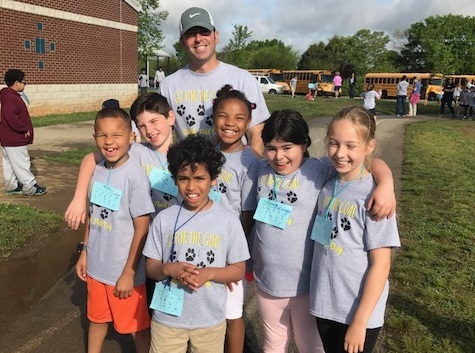 Shiloh held our annual Field Day on April 27! Thanks to the planning of Coach Roy and the assistance from staff members and parent volunteers, this year’s annual Field Day was a huge success! Students in all grades had an opportunity to participate in all the various stations that were set up along our playground. Shiloh thanks Mrs. Klutz for all she does as part of National School Library Week! It is National Assistant Principals’ Week! Shiloh takes this time to recognize and thank Mrs. Aldredge for all the great work she does for our entire school community. We are very lucky to have her at Shiloh!! Each month, a Shiloh staff member is selected by our parents to be our “Unsung Bulldog Award” winner. Shiloh parents have the opportunity to vote on-line for their choice of staff member who has gone above and beyond in his/her role at Shiloh. The minutes are in! 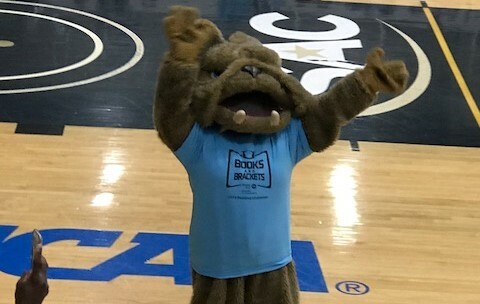 On March 2, 16 UCPS elementary schools advanced to the Sweet 16 round in the 2018 Books and Brackets reading challenge. This is a picture of 2nd grade parent Mrs. Tahani Alabbas. 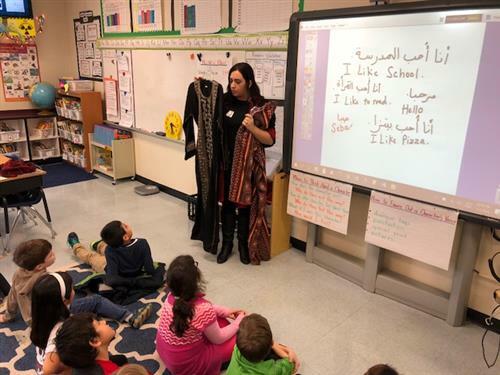 She is sharing information in Mr. Snyder’s 2nd about the culture of Jordan to her daughter’s second grade class at Shiloh Elementary School. Sun Valley Cluster elementary schools come together for our students! 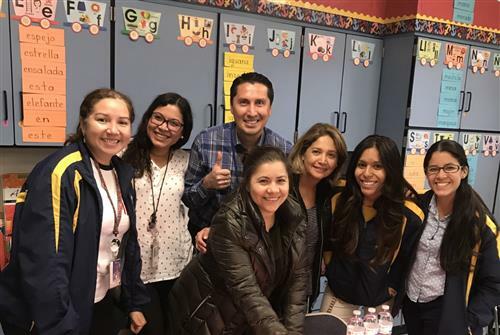 On the Early Release Day on Wednesday February 7, the elementary schools in the Sun Valley Cluster all came together for their professional development training! All certified staff from Indian Trail Elementary, Wesley Chapel Elementary, Sun Valley Elementary, and Shiloh Elementary joined together for an afternoon of collaboration, data analysis, and plans of action moving forward to help all students to be successful. Shiloh Celebrates Multicultural Book Week! Shiloh’s Media Coordinator Mrs. Jessica Klutz informed students in some of her classes about Multicultural Book Week. The classes then discussed what “multicultural” means. She used two of the North Carolina Children's Book Award Books to explain that those two books were written by two very special authors. Kindergarten registration for the 2018-19 school year officially begins on Feb. 1, 2018. While parents are able to register their students for kindergarten at any time during the year, we encourage you to enroll your child as soon as possible to ensure you receive all important communication from your child’s school. Shiloh celebrates our 100th day of school this year! 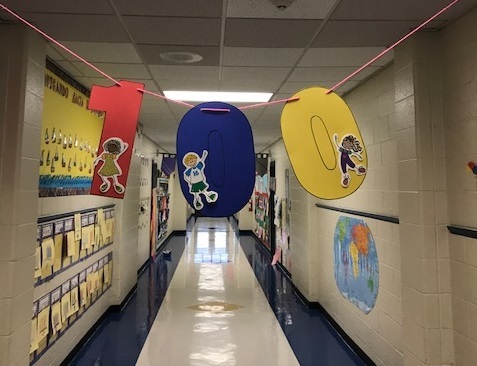 On Thursday, January 25, Shiloh Elementary School celebrated our 100th day of school for the 2017-18 school year. 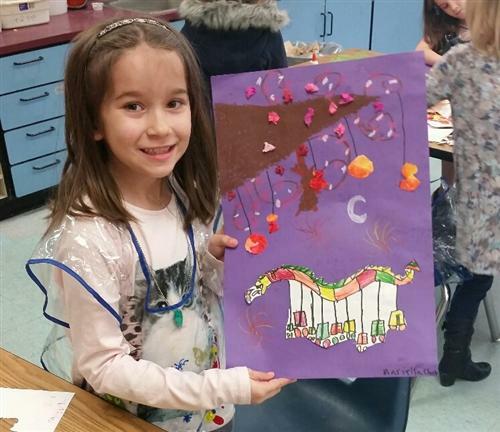 This annual milestone is celebrated in different ways across the grade levels. What did the students do on our 100th day? Desiring to learn more about immersion education in Union County Public Schools, Ivanna Anderson and Dr. Linda Lippitt toured multiple grades of immersion classrooms at Shiloh, Sun Valley and Kensington Elementary schools on Friday, December 8, 2017. Anderson works as an ESL / Title III Consultant for regions 4 and 5 with North Carolina Department of Public Instruction. Lippitt is retired as Henderson County Public Schools English as a Second Language Director Dr. Linda Lippitt. Welcome to Union County Public Schools! Thank you for choosing our school system to provide an excellent and well-rounded education for your child. 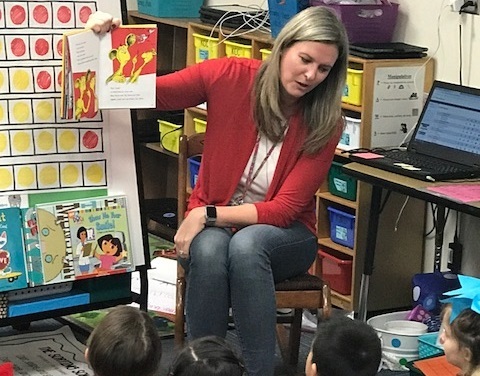 UCPS elementary schools have many competitive academic offerings, ranging from dual language immersion programs to STEM (science, technology, engineering and math) initiatives to arts programs. Mrs. Simons is a Top 20 finalist for the UCPS Teacher of the Year! Congratulations to Shiloh’s 3rd grade teacher Mrs. Melissa Simons for being chosen as a Top 20 finalist for the UCPS Teacher of the Year! We are very proud to have her on staff here at Shiloh. We are fortunate to have her leadership on both her grade level and throughout the school. Spanish immersion classes score a win! Students in Spanish immersion classes from Shiloh and Sun Valley Elementary School teamed up on Saturday, November 18 for a first-ever soccer tournament! Organized through the collaboration of parents, teachers, and administration from both schools, this event was surely a success! Our immersion families enjoyed the afternoon watching and playing soccer on Shiloh’s soccer field. It was also a great time for students and parents from both schools to get to know each other. 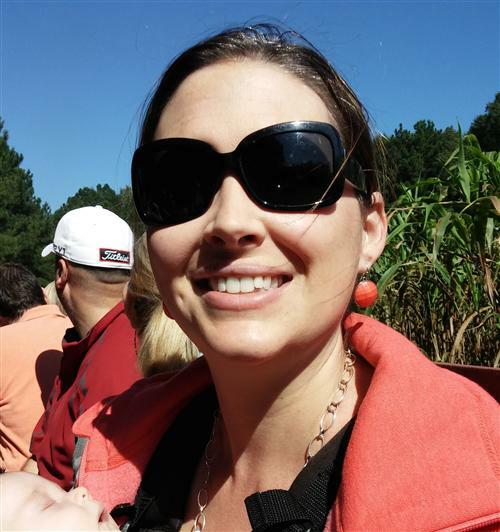 Melissa Simons is in her 15th year of teaching elementary school in NC. 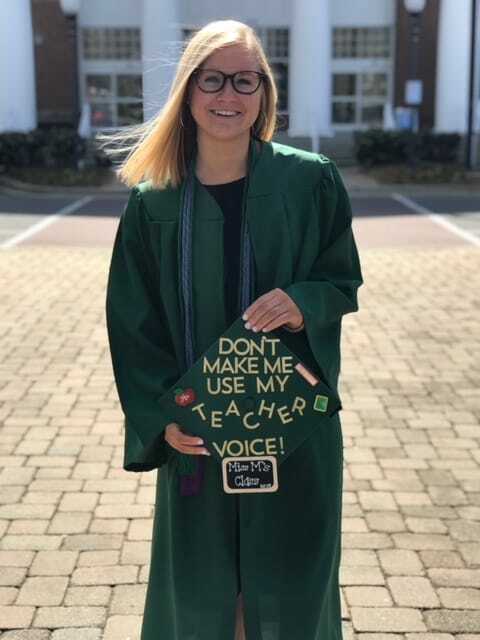 A graduate from UNC-Charlotte, and part of the first class of Teaching Fellows in NC, Ms. Simons majored in Early Childhood Education and has an additional certification in Reading Instruction. 3rd grade visits Old Salem! On November 3, Shiloh’s third graders traveled to Winston Salem to see firsthand what life was like hundreds of years ago. Mad Scientist Day returns to Shiloh! Shiloh’s families, staff and friends were proud to participate in the Vickie Johnson Cancer Walk on October 14th. This event was named in honor of long-time Shiloh After School Director Mrs. Vickie Johnson, who has organized several walks at Shiloh throughout the years. Our Shiloh community is now on our Fall intersession! 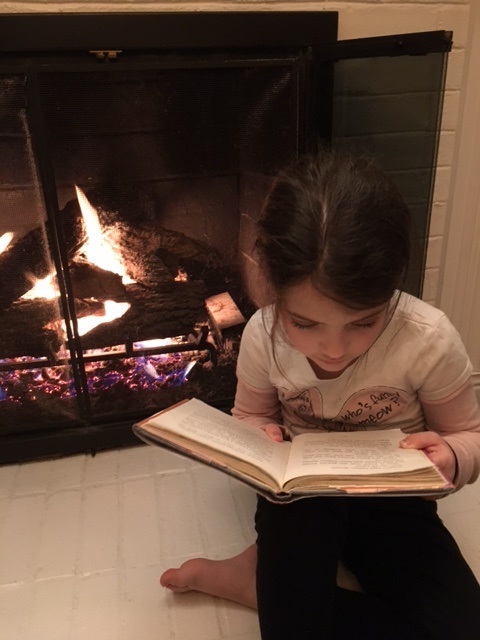 We hope that our entire school community is enjoying time for family, friends, fun, resting, and of course reading. Our students have worked very hard so far this year, and this is a well-deserved break. Special thanks to the entire Shiloh staff for their dedication and pursuit of excellence for our students. 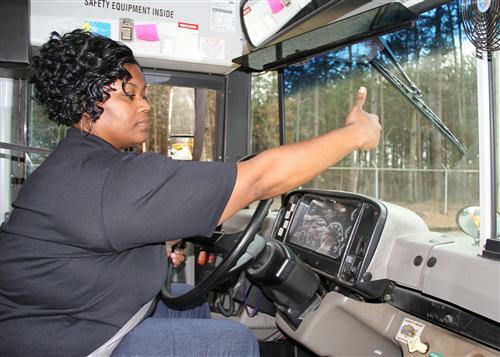 A record 15 UCPS schools recently received state recognition for their Positive Behavior Intervention and Support systems, and were praised for supporting high student performance while reducing behavioral problems. 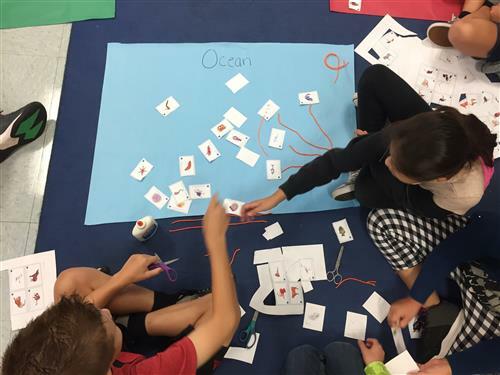 5th graders in Mrs. Lightner and and Mrs. Magnotta’s classes have been learning about ecosystems. This week, students focused on some of the interactions that are happening within them, specifically food chains and food webs. Our school is proud to announce that we are going to participate in the Vickie Johnson Cancer Walk on October 14, 2017 from 8 am - 12 pm on the Shiloh Elementary School track. The event is name in honor of long-time Shiloh After School Director Mrs. Vickie Johnson who organized and created these walks in past years at Shiloh. We are proud to say that Mrs. Johnson will be at this year’s event. Our Memory Garden has a new addition!! Our little library, “Kate’s Corner”, is ready to be filled with gently-used books for Shiloh students to borrow. 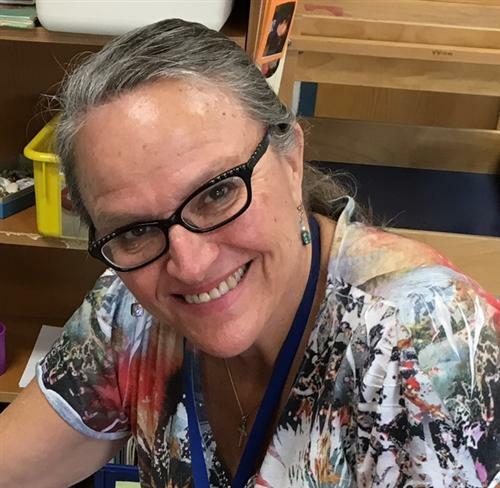 “Kate’s Corner” little library is named in honor of Kate Milutin, a beloved Shiloh teacher who retired in 2016 and moved to sunny Florida to enjoy the sand and the surf! For over 20 years Mrs. Milutin shared her love of reading with Shiloh students! She also encouraged all of us to not only recycle, but to reuse materials to make something new. August 21 was an exciting day at Shiloh as the solar eclipse began to pass overhead shortly after 1 PM! With all the excitement, what did our students do that day? Shiloh students Skype with students in Ecuador! 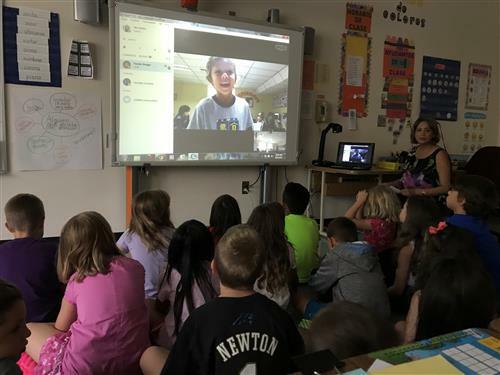 On August 15th, Shiloh’s second grade SPLASH students had the opportunity to meet with the second graders of Monte Tabor Nazaret School in Ecuador via Skype. Mrs. Molina, their Participate teacher, organized this experience. For this occasion, our students communicated with the Ecuadorian students who will be their “Pen Pals” for the rest of the school year. Shiloh’s students are goal setters! 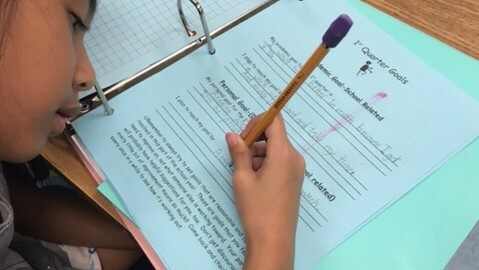 This year, Shiloh’s students in all grades are working to set academic goals. The reason for this is so that our students can help self-monitor their own progress and take accountability for their own learning. Shiloh comes to the neighborhoods! In an effort to spread the message about Shiloh’s literacy program called #ShilohReads, Shiloh staff members have left the walls of the school! The first of several on-going visits to our school community this year began on Saturday, August 5. Mrs. Ladd, Mrs. Guzman and her two young children, and Mr. Spencer walked through the communities of Wincrest and Meriwether passing out #ShilohReads brochures and informing parents about our upcoming Grade Level Nights. Shiloh’s 1st PTA Night of the year was a success! 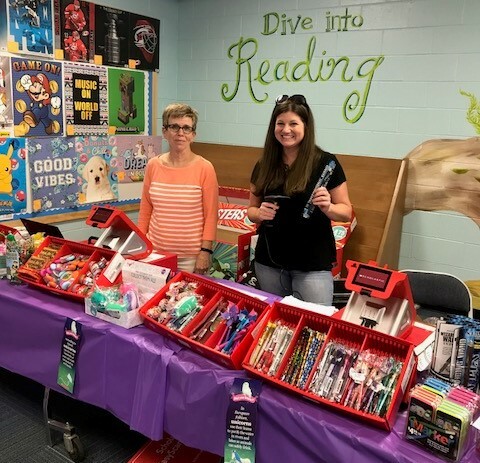 Shiloh’s PTA held their first Family Night of the year on Thursday, July 27 at the Highway 55 in the Sun Valley Commons shopping center. Shiloh’s 1st day was a success! The faculty and staff of Shiloh Elementary would like to welcome you and your child to a new school year! As a school community, we believe in maintaining high standards and expectations for our students. We are proud to say that we were a 2013 National Blue Ribbon School, and we met our expected growth on the 2016 NC End of Grade tests. We are about to begin the 2017-18 school year, and I am very excited about that. 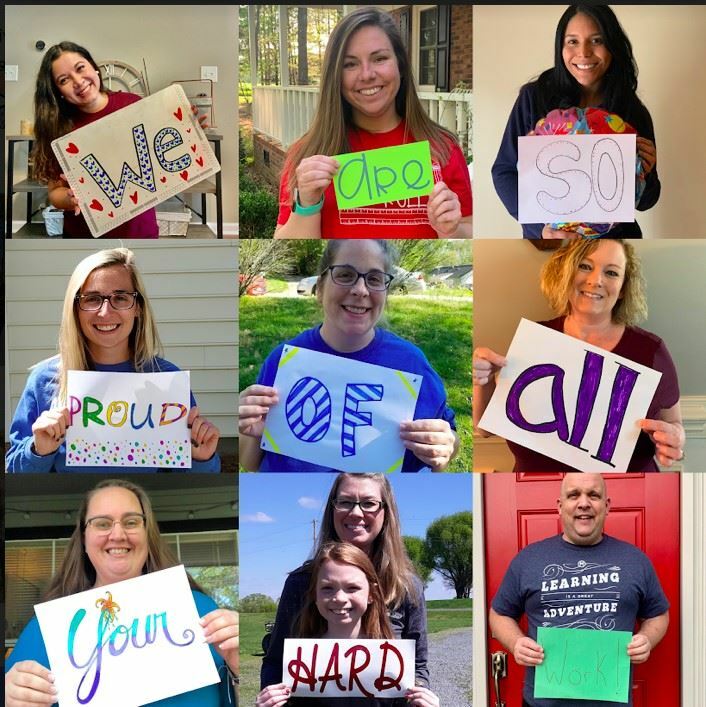 Our staff has been working very hard to ensure that your child has a challenging, rewarding, and memorable educational experience here at Shiloh. 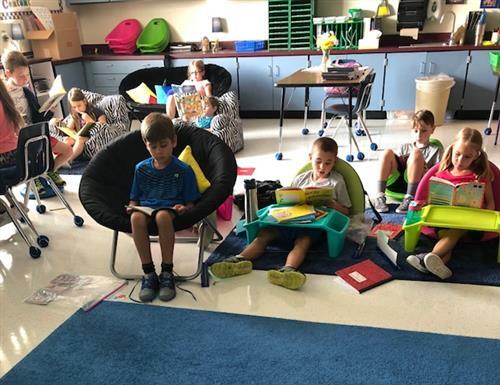 We all know how important it is to read even when school is out for summer break! 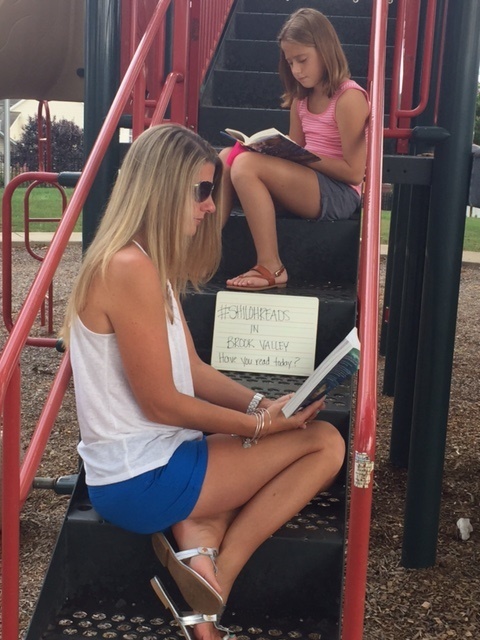 To keep it interesting, Shiloh families are getting creative with their reading. 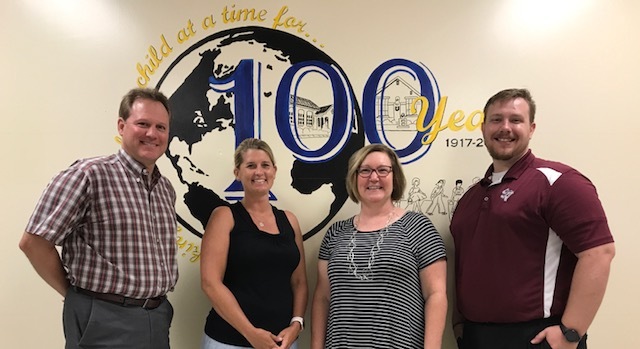 Three hundred UCPS principals, assistant principals and curriculum staff flooded Cuthbertson High School this week for the Summer Instructional Leadership Institute, the school district’s annual three-day professional development conference. On June 2, Shiloh 5th grader Madison McLeod became the first recipient of Shiloh’s new Steve Morris Education Award. The award, consisting of a certificate and a scholarship to the winner, recognizes one 5th grade student at Shiloh who demonstrates the traits and qualities of a future teacher. Shiloh bids farewell to our 5th graders! While we are always sad to see our 5th graders go, we enjoy planning and taking part in all of the end of year activities that take place in their honor. One of the first events was BASH, where students were encouraged to take a leap back in time, dress in 50s fashion, and dance the afternoon away with rootbeer floats, popcorn, cupcakes, and the yearbook reveal. Kindergarteners in Mrs. Livesey’s class got to work with Instructional Technology Facilitator Henry McGee this morning, as they learned how to use ActivExpressions in an activity practicing their addition facts. ActivExpressions are a student response system that enable teachers to poll their students to assess progress and based on their responses create lessons to meet specific student needs. 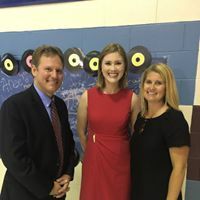 A meteorologist from Charlotte’s WSOC TV came to Shiloh Elementary on Wednesday, April 26th to speak to 5th graders to supplement our weather unit. John Ahrens spoke about the wonders of weather around the world. He helped further explain how meteorologists use science to predict upcoming weather events from data collected through observation and measurements. Learn about Shiloh’s Cultural Presentations from a parent’s perspective! Today was a fantastic kick-off to a very important week for our family: International Week at Shiloh. My daughters have been extremely excited and proud about the dances they have been practicing. They couldn't wait for Monday to wake up early, get their hair done, get their authentic dresses on, and represent their assigned countries. On Monday, April 17, 2017, members of Indian Trail's Parks and Recreation visited Shiloh Elementary 4th graders as part of the Mayor Tree Initiative. They taught students about the importance of a community forest and how they can help protect and expand the one we currently have. Shiloh’s Second Graders Travel Around the World! A virtual six week journey around the world allowed Shiloh’s Second Graders to dream about the wonders of the world. 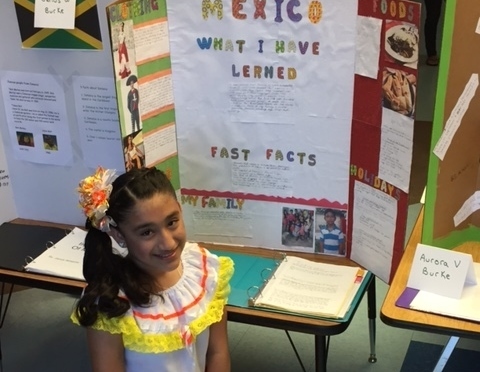 Many cultural traits like language, currency, food, location, traditions, landscapes, and celebrations have been topics of study when learning about Mexico, Kenya, Brazil, China, Australia and many other countries. Second graders enjoyed watching stories written by first through fourth graders from different parts of the United States. The group Story Pirates presented the stories through acting, singing, and music. The third graders at Shiloh Elementary became invested in providing clean water for children in Africa in March. After skyping with Mr. James Wilde, CEO and founder of Global H20 all the way from Uganda, the children researched the clean water crisis that plagues so many across the globe. They were especially dismayed to find out that water-related diseases are responsible for millions of deaths a year worldwide, most of them women and children. So the students decided to take action. Students at Shiloh Elementary enjoyed watching “The Conservation Caper,” a show about green living and saving energy. 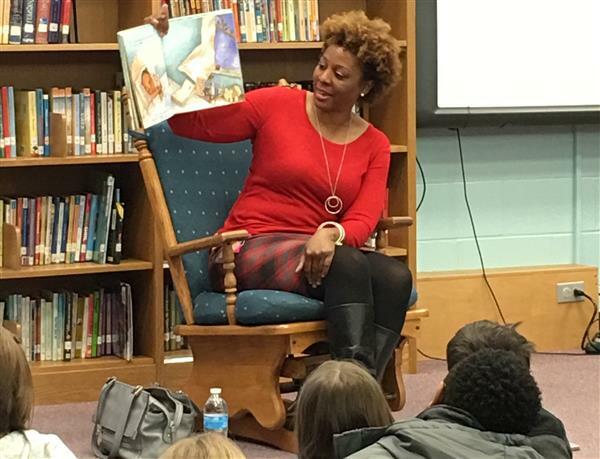 Duke Energy provided this energy conservation program by bringing Kali McMillian and Evan Jackson from The National Theatre for Children to Shiloh. 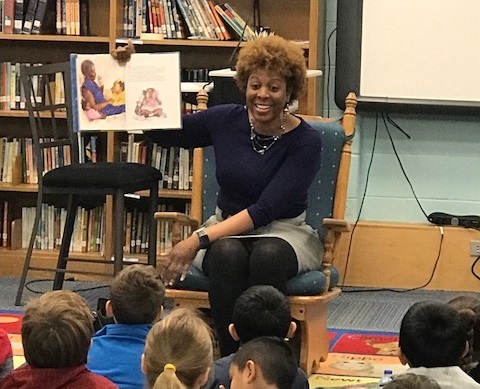 In celebration of Black History Month, Shiloh Elementary held its annual African American Read-In on Thursday, February 16. Shiloh Elementary School will be hitting a milestone that sets them apart from many other schools across America. The school is celebrating its 100th birthday. This award-winning school has been providing a quality education for a century to thousands of Union County children. Shiloh is thankful for our counselor Mrs. McGinniss! I have worked at Shiloh for 16 years! I have two children, Megan a fifth grade student, and Braxton a second grade student both here at Shiloh. We are expecting a baby boy in June! This week during media center specials, grades K-5 are working on special Valentine's for the residents at the Lake Park Nursing Home. When the students first walk into media class, they learn about Valentine's day through fiction and nonfiction stories such as the story "Somebody Loves You, Mr. Hatch," by Eileen Spinelli. The Town of Indian Trail declares February 18, 2017 as Shiloh Day! The Indian Trail Town Council honored the legacy and impact of Shiloh Elementary School at a recent meeting by proclaiming Feb. 18, 2017, to be Shiloh Elementary School Day in honor of the school's Centennial. Shiloh learns about and discusses Martin Luther King, Jr. 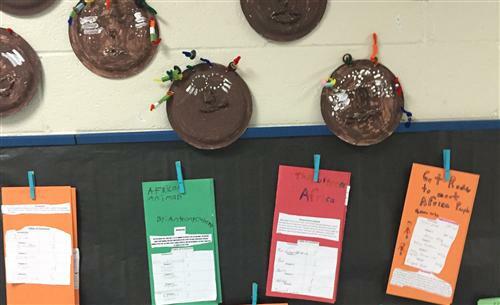 Here is a glimpse into what the grade levels discussed at Shiloh about Martin Luther King, Jr. In Kindergarten, we watched Kid President explain the importance of Martin Luther King, Jr. We read “The Story of Martin Luther King, Jr.” by Johnny Ray Moore. On December 7th, Shiloh’s first grade SPLASH students had the opportunity to meet with the first graders of Monte Tabor Nazareth School in Ecuador via Skype. Their VIF teachers Mrs. Lilly Molina and Mrs. Julissa Garcia organized the experience for their students. Shiloh’s Girls on the Run team races to success! 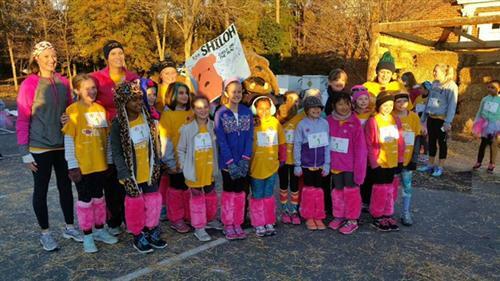 On Saturday, December 3, Shiloh’s Girls on the Run team participated in the annual Ginger Snap 5K in downtown Waxhaw. Our girls have worked very hard to prepare for this race. Their practices after school paved the way for a fantastic experience for them this past weekend. On Tuesday, November 29th, Shiloh’s fifth graders visited Sun Valley High School for their annual Fine Arts Day. This gave our students a glimpse at band, choir, theater, and other creative atmosphere at the high school level. 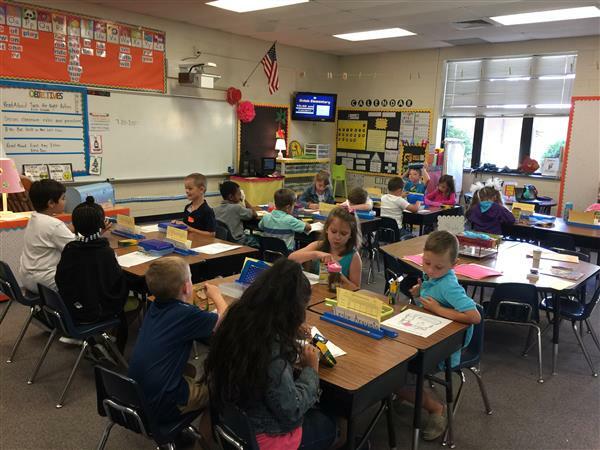 2nd Graders learn about weather! Hail! Sleet! Snow! Rain! These are types of precipitation that the 2nd graders at Shiloh are becoming experts at describing. When learning about the weather, who's the best person to ask? A meteorologist of course! On Thursday, November 10, Shiloh’s third graders traveled to Winston Salem to see firsthand what life was like hundreds of years ago. They visited Old Salem and were greeted by folks dressed in period clothing who taught them all about life in the 1700’s when Old Salem was first founded. On Wednesday, November 9th, Shiloh’s 5th graders spent the day at Camp Thunderbird in Lake Wylie, South Carolina. The day was filled with adventure and learning. Shiloh SHOWS its love of reading to our students! Shiloh opened its doors to the school community on November 10 for one of our most popular events known as SHOW ME. SHOW ME (“Shiloh’s Open Working Media Event”) was a chance for students and their families to participate in a book swap. Our school feels strongly that there is nothing better we could do outside of the school day than to put books in the hands of our students. Shiloh’s Mad Scientist Day 2016! 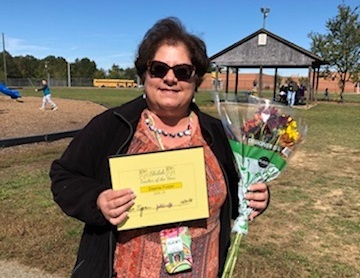 The first recipient of the Union County Public Schools Employee of the Month award is credited with helping to make her school an inviting place to visit. 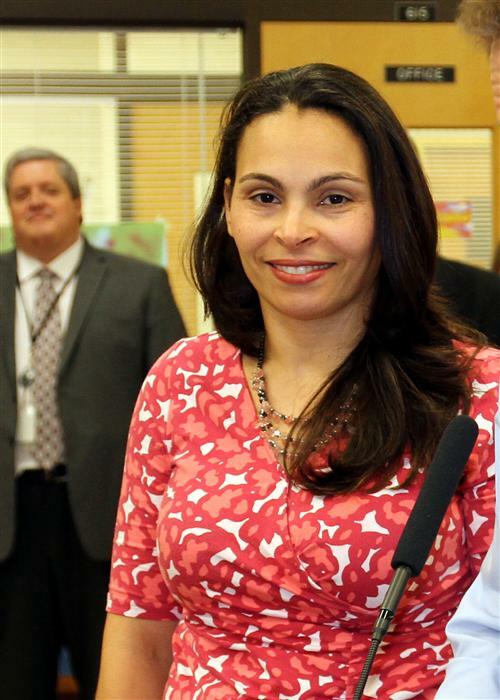 Fatima Feliz, who has served as a custodian at Shiloh Elementary School since February, was recognized at Tuesday’s, Nov. 1, Board of Education meeting with the first EOM award. If you happened to be in the halls of Shiloh Elementary on Friday, October 21, you might have been lucky enough to meet Jackie Robinson, Harriet Tubman, Martin Luther King Jr. or even ole Honest Abe! The halls were swarming with famous people, past and present, portrayed by the third grade students at their third annual Living Museum. Mrs. Long is a Top 20 finalist for the UCPS Teacher of the Year! We are so proud of Mrs. Long!! Where did you grow up? I grew up on the other side of the Smoky Mountains in Maryville, Tennessee. Where did you graduate from high school? I graduated from Maryville High School. Second graders took a virtual tour to Spanish wonderland. They learned about the 21 Spanish speaking countries around the world, their location on the global map, colored each country’s flag and saw real pictures of some of these countries through Google Maps. 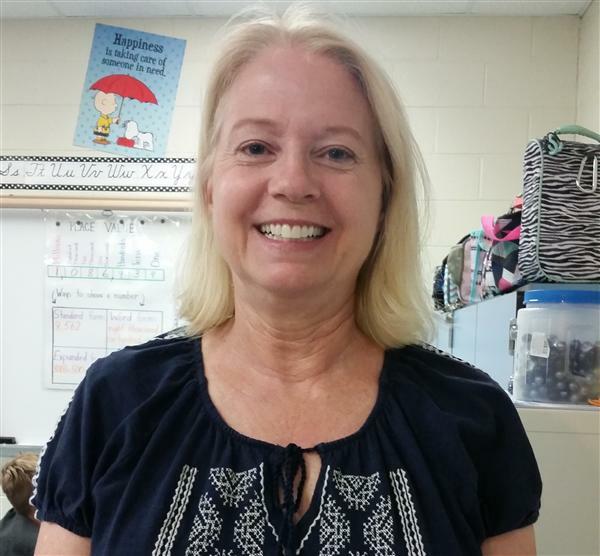 Dee Hasty, an exceptional children’s teacher at Shiloh Elementary, has been named a 2016 Exceptional Children’s Teacher of Excellence. She was informed by EC Director Janie Webb during a staff meeting at her school Wednesday (Sept. 21). 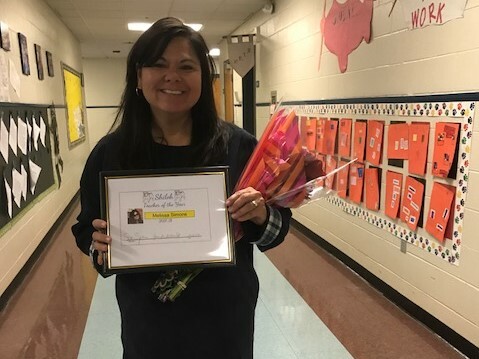 Meet Mrs. Robin White-Shiloh’s Teacher Assistant of the Year! Who runs toward danger while the rest of us run away? Firefighters, law enforcement officers and paramedics. Shiloh Elementary students took time Friday, Sept. 9, to thank these brave men and women for their service by providing lunch during an event called “Heroes Day.” At left, Monroe Fire Battalion Chief Andy Ross talks with a student. 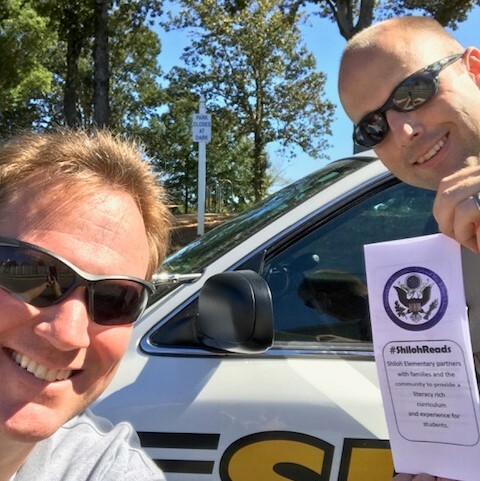 Shiloh recognizes our local heroes! On Friday, September 9th, local heroes were invited to Shiloh in honor of Patriot’s Day. Mrs. Kim Winchester, the Cafeteria manager, organized the event. 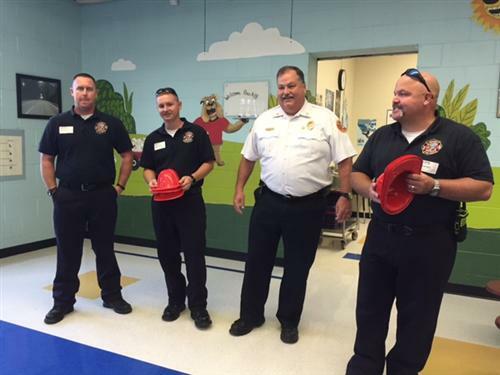 Mrs. Winchester explained, “It’s just an opportunity for the kids to have fun with the firefighters and the police officers and to not be afraid to be around them. Shiloh reaches out to our community to promote literacy! Our fourth annual Shiloh Family Literacy Night will be held Thursday, September 8th from 5:00 PM-7:00 PM. All Shiloh family members are invited and encouraged to attend! The goal of Literacy Night is to show families how important it is to read and write together nightly. Sometimes it can be difficult to think of reading and writing ideas that encompass the whole family, so we are here to help! Check out 5th grade science at Shiloh! In Mrs. Lightner's science class, students have been learning all about ecosystems. We have been learning how plants and animals depend on one another to survive within their environments. We have had the opportunity to compare several common ecosystems through research, both inside and outside our classroom by creating different ecosystem projects. 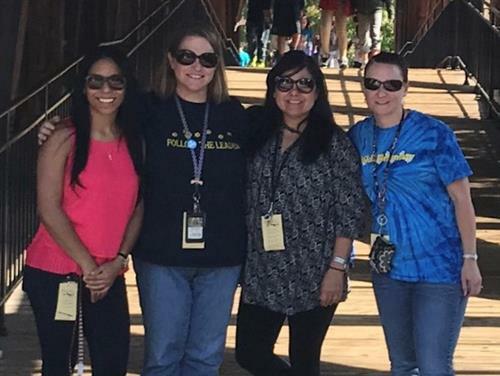 Starting its fifth year at Shiloh, the SPLASH program is an international program that brings teachers from different countries around the world (Latin America, England, China, Europe and South America) to the United States. Their job is to enrich students’ cultural knowledge and to give them the opportunity to learn another language. Union County offers a Mandarin program in two schools and a Spanish program in seven schools. Shiloh currently has one Spanish class in grades Kindergarten through Fourth. Hello Shiloh! I am Miss Carvacho, I’m from Santiago de Chile in South America and I’m here as part of the Splash Spanish immersion program. This will be my 5th year as a teacher and I feel as in loved of my profession as my first day in the classroom. 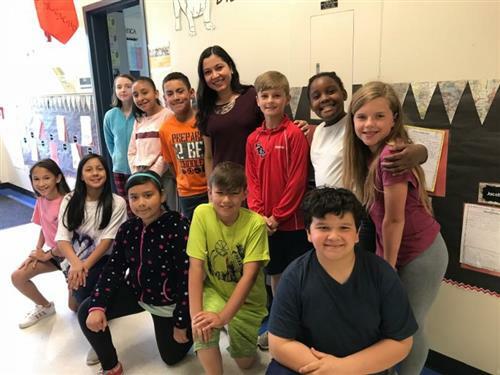 Shiloh welcomes Mrs. Sirly Castellar! My name is Sirly Castellar. I have a Bachelor of Art degree in Foreign Language Education (English, French, German and Spanish). I am doing a master degree in TESOL. (Teaching English as a Second Language). Shiloh welcomes Mrs. Highsmith to our staff! Hi! I am so happy to be a part of the Shiloh family. Teaching the Pre-K EC blended class is a joy and a challenge every day. I was born and raised in Richmond, Virginia and graduated from the University of North Carolina at Chapel Hill with a degree in Early Childhood Education. 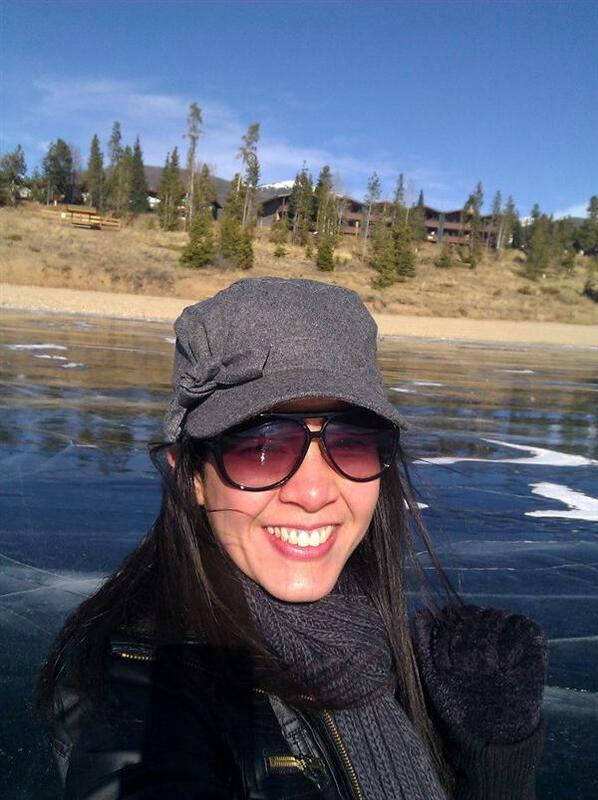 Shiloh welcomes Mrs. Garcia to our staff! ¡Hola! My name is Julissa Garcia. I'm from Colombia, a beautiful country in the north of South America. I have been teaching for seven years in different schools in my country. Shiloh welcomes Mr. Gonzalez as our 4th grade Splash teacher! Hello! 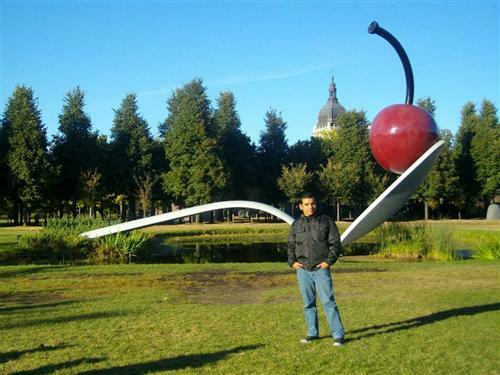 My name is Carlos Gonzalez and I'm from Bogota, Colombia. I have been teaching for twelve years in different schools in my country, and I have been sharing experiences with children from many different places around the world. I studied at Universidad Pedagogica Nacional de Colombia. Teamwork: the combined action of a group of people, especially when effective and efficient. UCPS Superintendent Dr. Andrew Houlihan is a firm believer in the concept. Shiloh welcomes Mrs. Keilen to our 5th grade team! My name is Alexandria Keilen and I’m excited to be teaching at Shiloh Elementary this year. Even though I was born in Anchorage, Alaska, I grew up in Charlotte and graduated from Myers Park High School. Then I received my education degree from Elon University as a Teaching Fellow. Shiloh welcomes 4th grade teacher Mrs. Stevens! Let’s learn about Mrs. Stevens in her own words… Hello! I am from the mid-west. I grew up in Wisconsin, and went to Luther College in Decorah, Iowa and received my master’s degree from Western New Mexico University in Silver City, NM. On Thursday, July 21 Shiloh opened its doors for the start of the 2016-17 school year. This is a very special school year as Shiloh becomes one of a small number of UCPS schools to reach the 100 year mark. That’s right- this is Shiloh’s 100th year! In true Shiloh style, the first day of school went very smoothly, and our staff members enjoyed seeing returning students and meeting new students. 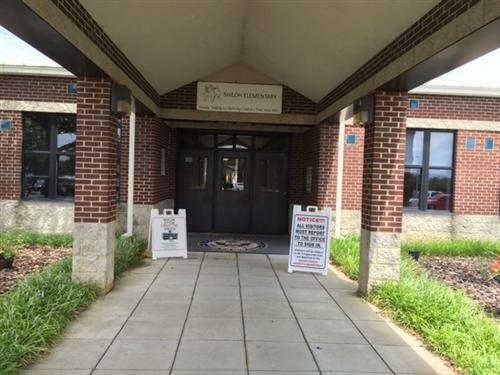 Shiloh holds its Open House for 2016-17! On Tuesday, July 19, Shiloh opened its doors to the school community for its annual Open House. The school was proud to host this exciting event as it enters into its 100th year! 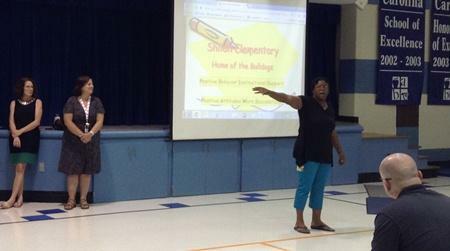 Shiloh staff were eager to greet both new and returning Shiloh families and students. During the event, parents and students had a chance to meet their teachers and to learn about important school information for the upcoming year. Mr. Spencer welcomes the Shiloh community to the 2016-17 school year! As we head into the last few days of June, we hope that everyone is enjoying the summer. One of the most common questions that we are asked is, “What do you do over the summer?” That is a fair and reasonable question, and we’d probably also wonder what schools do during the summer weeks if we didn’t work in one. Science is cool at Shiloh! 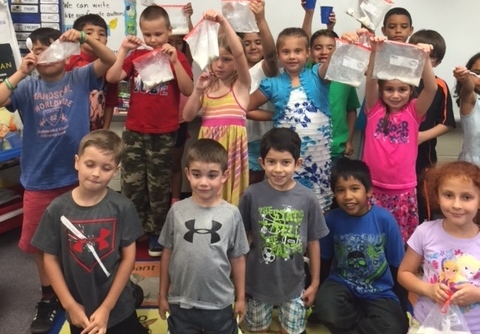 Mrs. McCraney’s First Grade Class ended the school year with one “cool” science experiment. They made ice-cream in a bag. Shiloh is on summer break! The 2015-16 school year has come to an end and it is now summer! Shiloh thanks our school community for all of the support that we received from parents throughout the year. Third graders have been engrossed in a study of countries around the world. Each third grade class picked a continent to explore. Shiloh 5th graders spent the winter months learning more about themselves. As part of a social studies project, the students researched their family background to learn about their heritage. 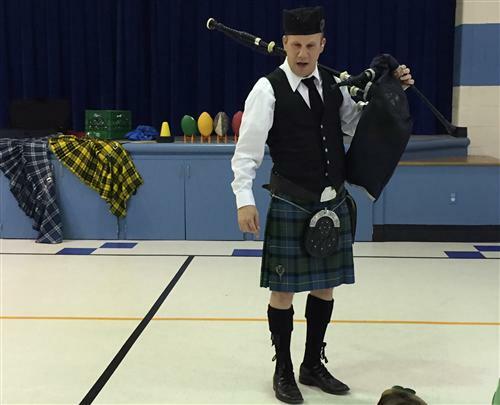 Shiloh Kindergarteners enjoyed the bagpipe music of Mr. Lee McLeod on Thursday, March 17th, as they learned about St. Patrick’s Day. 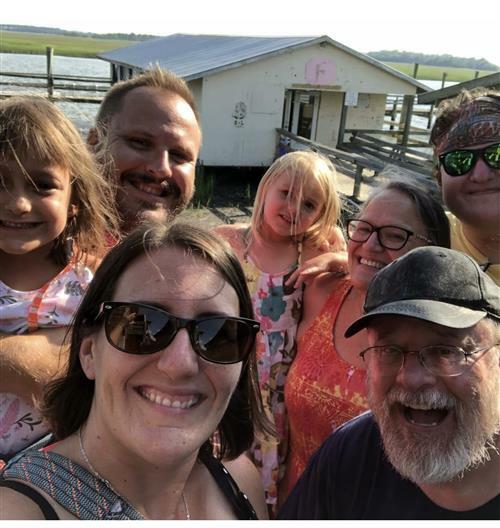 Mr. McLeod is a member of St. Andrews Univeristy Pipe Band in Laurenburg, NC, and the father of Kindergartener, Cameron McLeod. The Union County Board of Education met this morning to discuss the Superintendent Search process. The Board voted on a number of items including naming an interim superintendent and interim deputy superintendent. 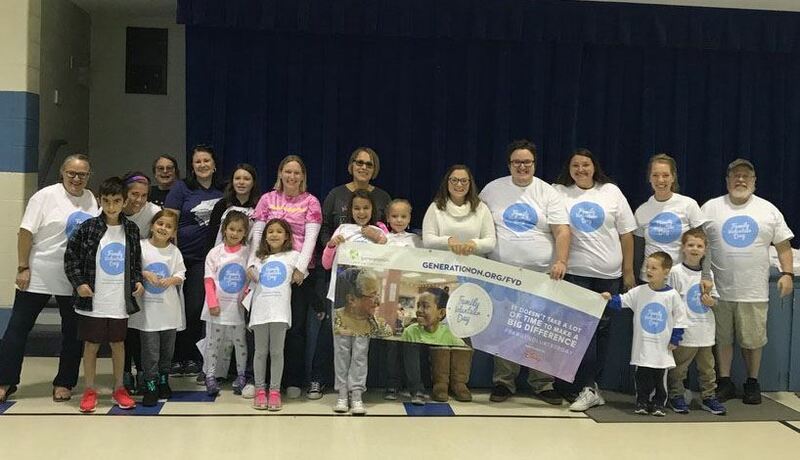 On March 3, Shiloh Elementary students got a visit from our local “tooth fairies.” Guest speakers from Laxer, Long, and Savage Dentistry came out to teach us about dental health. “It doesn’t matter about our skin color. It just matters that we're human beings. 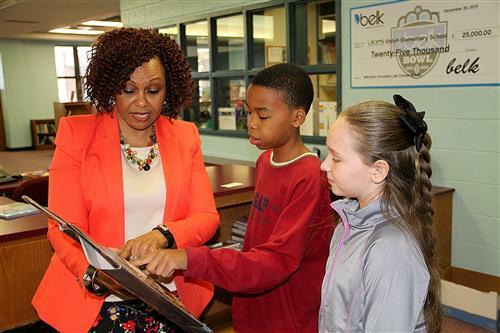 … Never judge anybody from the outside.” Kaleb Jones, (pictured at left) an 11-year-old student at Shiloh Elementary School, was one of about 550 elementary school students who were treated to special guest readers in the school’s annual African American Read-in. Obviously, the lessons learned during Black History Month aren’t forgotten. On Wednesday, February 10th Shiloh students had the pleasure of watching the performance Meet Dr. King, an entertaining educational program that retells the life of Dr. Martin Luther King Jr.
Fanonola Sturdivant, a six-year-veteran bus driver in the Monroe cluster, holds her hand up, palm facing the students waiting at their bus stop, warning them to wait before crossing the street. Shiloh is proud to announce that we are a National School of Caring. Once again, our school strongly responds by coming to the aid of those in need in our school community. We are partnered with the “Souper Bowl of Caring” to collect donations for the Union County Community Shelter’s Soup Kitchen. On January 6, the Three Kings Celebration is part of the Hispanic Traditions. The second grade team is integrating this celebration in our planning, as we are studying maps, continents, and countries in Social Studies. We will be identifying all Hispanic countries in the world and the children will locate the countries on world maps. Kindergarten students learned about various holidays around the world during the month of December. During their daily calendar time, students explored countries throughout the world, studying their maps and learning about different holidays that take place throughout the year, including Night of the Radish in Mexico, Tree Planting Day in China, and Seafarer’s Day in Iceland. On December 10th, Kindergarten students participated in Holidays Around the World Rotations, learning about four holidays in depth as they visited each kindergarten classroom. 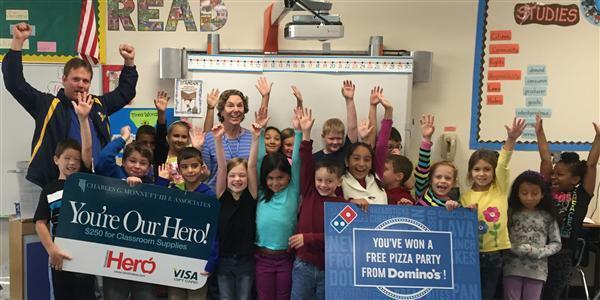 Belk announced the winners of its 2015 Belk Bowl Innovation Lab contest, which gives local schools the opportunity to remodel their current media center to create a welcoming, innovative learning space and improve reading efforts. Marshville Elementary and Shiloh Elementary each won a $25,000 technology grant. Shiloh students are collecting non-perishable food items for the Union County Christmas Bureau. The Kiwanis Club of Monroe will pick up our items on December 11th to deliver to the Christmas Bureau. Shiloh welcomes the school community! 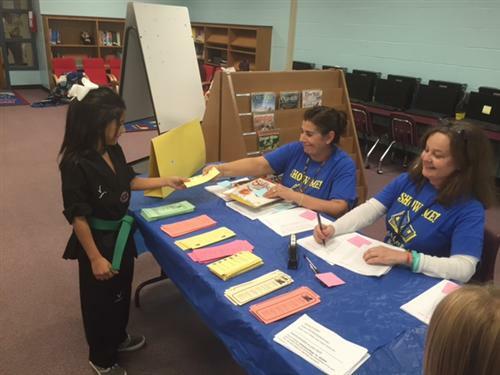 On Friday, November 13, Shiloh opened its doors for two exciting events for students in all grades. The evening first began with SHOW ME (“Shiloh’s Open Working Media Event”) from 5:00-6:00 PM in the Media Center. For SHOW ME, Shiloh collected books for a week from students for a book swap. Students and their families who donated books were able to participate in the swap. This fall, Shiloh’s 5th graders had a special guest speaker. Peace Corps volunteer Rachel Crabtree came to visit! The Peace Corps is a U.S. volunteer program. 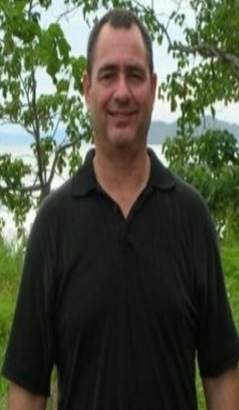 Their mission is “to promote world peace and friendship.” Rachel was stationed in Cambodia in Asia. She lived with a Cambodian host family for one year. In Cambodia, she worked as an English teacher with 9th graders. Mad Scientist Day at Shiloh! On Friday, October 30, Shiloh hosted our 2nd annual Mad Scientist Day. 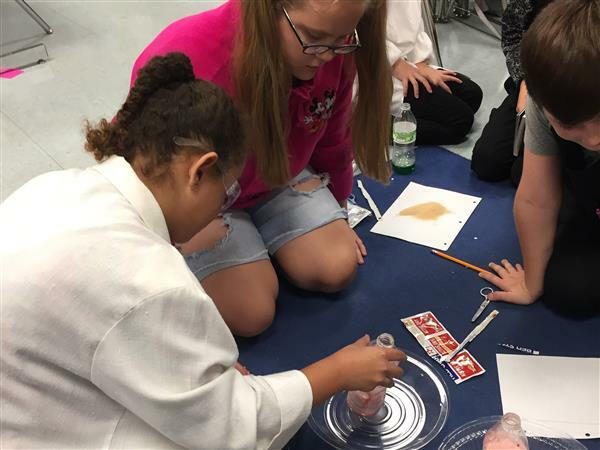 Based around the ideas of increasing our students’ interest in and love of science, the day featured several exciting, hands-on activities across the grade levels. Please read more to learn more about this exciting day at Shiloh! 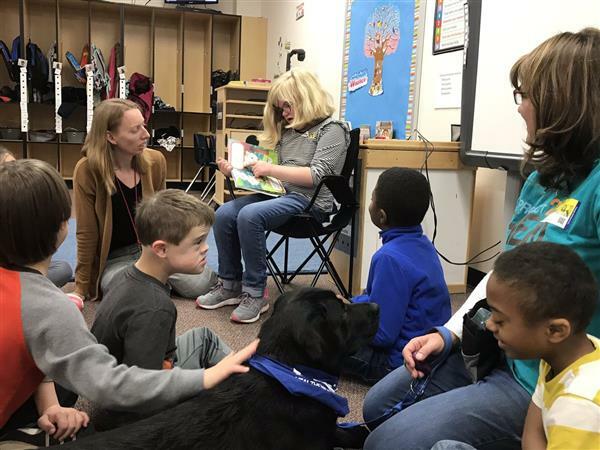 The look on Terri Brown’s face was priceless when her principal and 9 of her colleagues made an unexpected visit to her classroom on Oct.16. 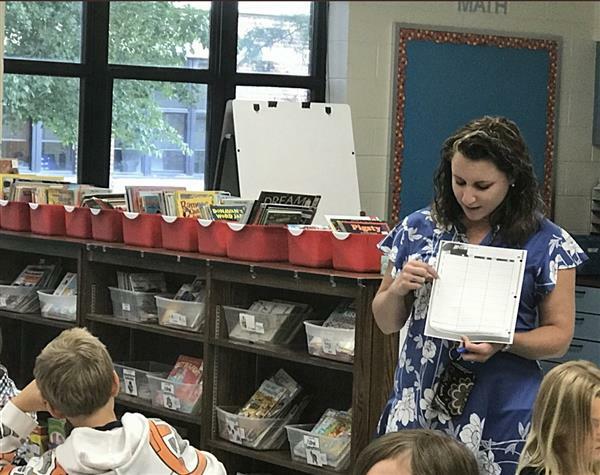 Brown, a second-grade teacher at Shiloh Elementary, was named the October Hometown Hero for Union County Public Schools. 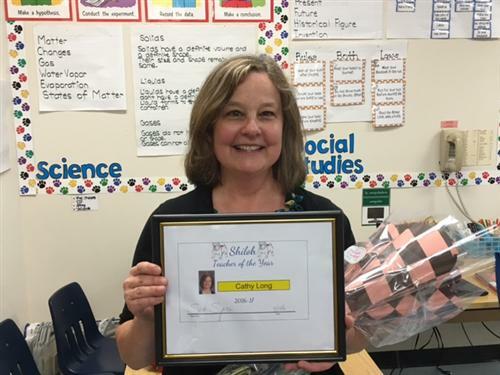 Mrs. Patricia Livesey is Shiloh’s Teacher of the Year! 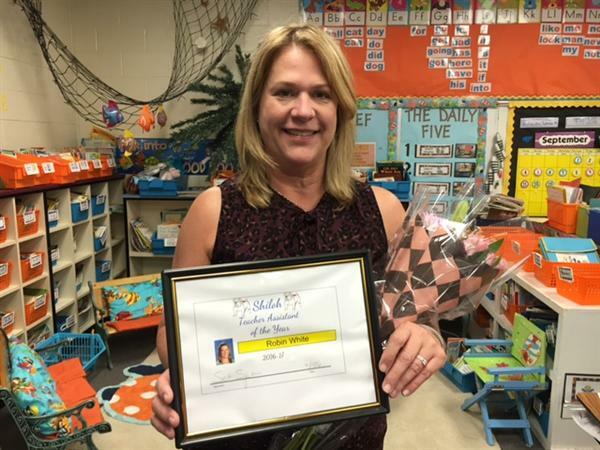 Mrs. Debbie Archer is Shiloh’s Teacher Assistant of the Year! 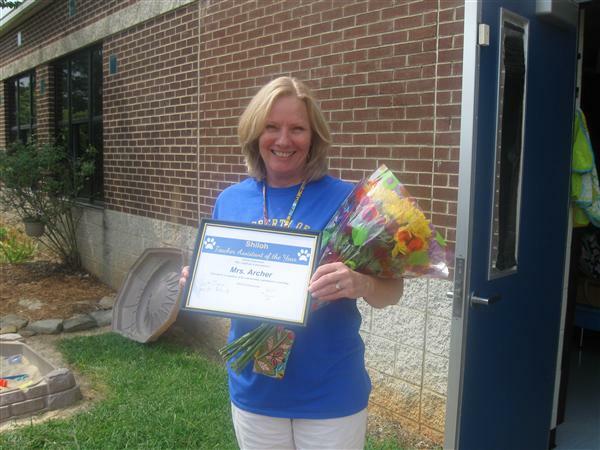 Congratulations to Mrs. Archer! Let’s learn a little bit more about her. 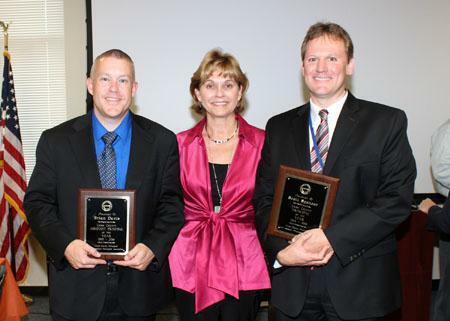 Shiloh Elementary Principal Scott Spencer and Parkwood Middle Assistant Principal Brian Davis have been chosen as UCPS' top administrators. Shiloh is on Fall break! Shiloh has just begun our two week Fall break. We hope that everyone is able to relax during this time off, and to find time for family and friends. Also, please be sure to set aside some time for reading as well. Speaking of reading, our Media Center is currently undergoing quite an exciting transformation! 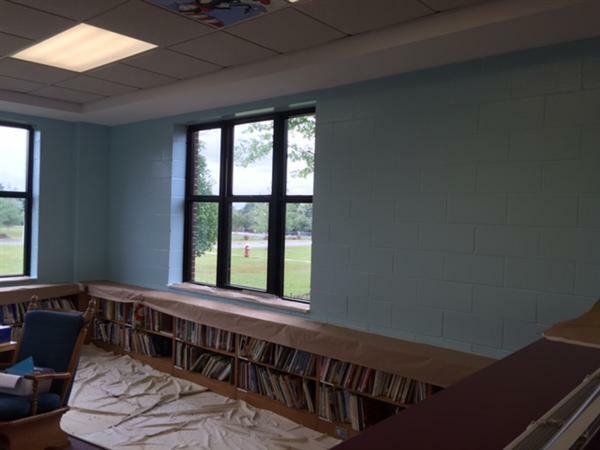 Thanks to our generous PTA, our Media Center is currently in the process of being painted a very soothing shade of blue. Shiloh was treated to a performance by members of the Charlotte Hornets organization on September 14, 2015! Their mascot Hugo came to help put on a show for all of our students in grades 3-5 on the importance of reading. The show highlighted many reasons why it is important to read. 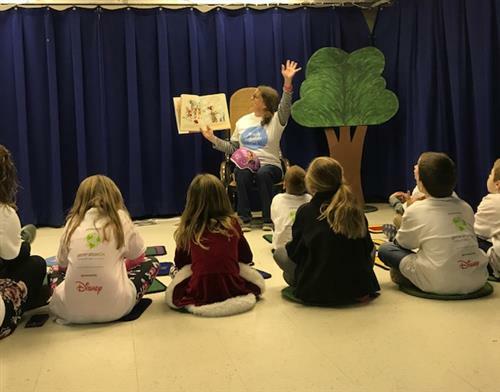 Students were told stories, listened to fun songs about reading, and shown inspirational videos that truly emphasized the power and importance of reading. On Saturday August 29, members of the Shiloh faculty participated in the United Way Day of Caring, a day dedicated to serving others in the community. Our teachers were very proud to be a part of this opportunity. Kindergarten’s global study of houses! 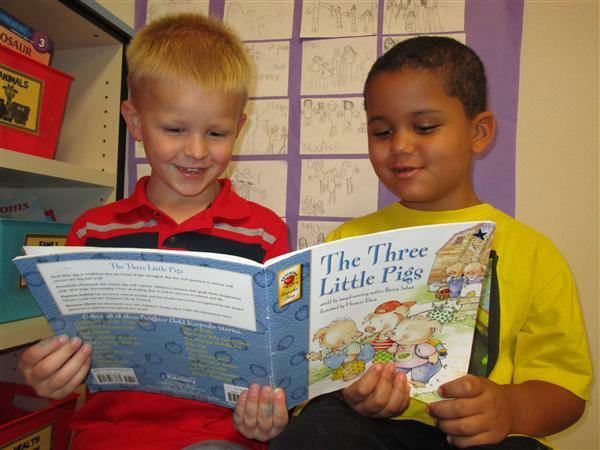 Shiloh Kindergarteners recently finished a study of houses, which began with reading “The Three Little Pigs.” Kindergarteners enjoyed acting out the story, taking on the voices of the Wolf and each of the Pigs. After reading the story, children discussed the materials used to build the houses: straw, sticks, and bricks, and made conclusions as to why the bricks were stronger. There is a BUZZ around Shiloh! 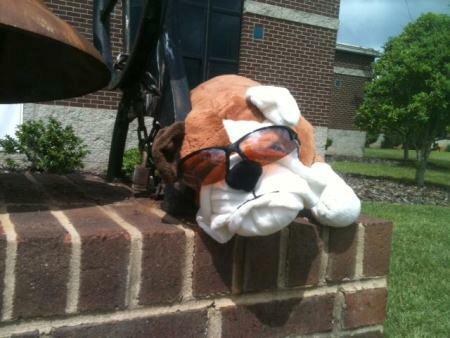 The “Bulldog Buzz” will be Shiloh’s new communications club. Members will be responsible for keeping the student body up-to-date on school events. 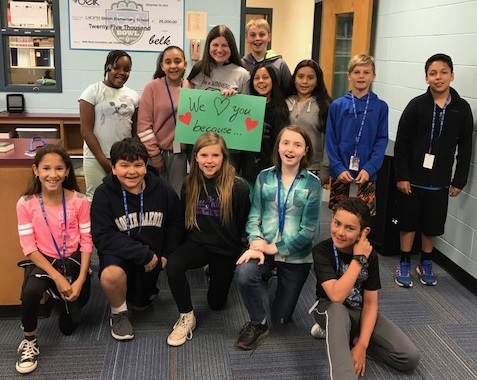 The BUZZ club will compose website articles, film commercials for School News broadcasts, create posters and bulletin boards, and help with morning announcements from time to time. 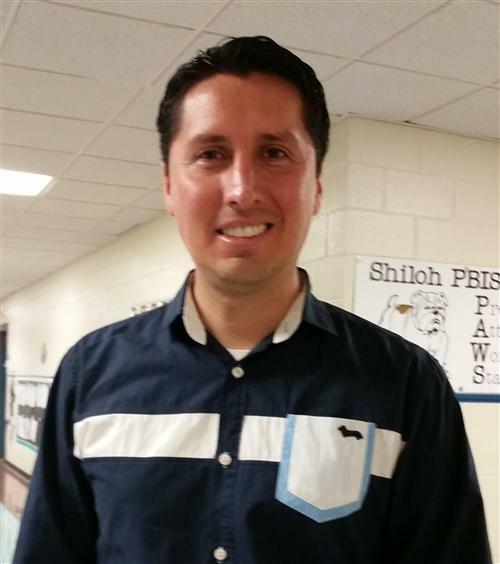 Shiloh welcomes Mr. Arredondo to our Splash team! My name is Francisco Arredondo Cerda. I am from Santiago, a huge city, which is the capital of Chile with a population of 6 million people approximately. 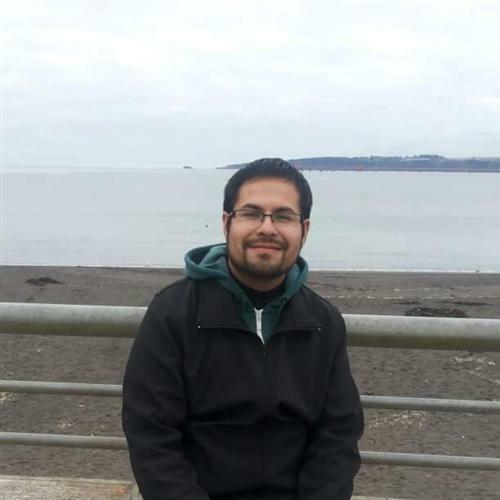 Shiloh welcomes Mr. Quintero to our SPLASH team! Hello Shiloh Family, I want to tell you some important things about me: I am Ivan Quintero. I was born in Sevilla Valle, Colombia, a beautiful town to visit in my country. Shiloh hosts “Grade Level Night” for our K-2 classes!